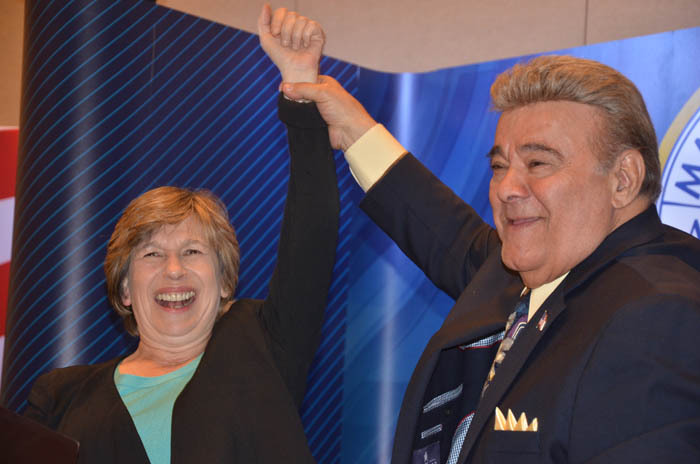 MTD President Michael Sacco lifts AFT President Randi Weingarten’s arm in triumph following her address to the MTD Executive Board. Recalling how labor solidarity decades ago insured the viability of her own local union, American Federation of Teachers (AFT) President Randi Weingarten told the MTD Executive Board that that same cohesiveness will carry the battle to preserve the Jones Act just as it won the recent strike for West Virginia teachers. Weingarten kept the board members and guest enthralled as the final speaker for the March 8-9 meeting near Orlando. Not only did she address the two issues above, she also spoke about the most recent attack on public sector unions and relief operations in Puerto Rico. Gesturing toward MTD President Michael Sacco, who also serves as president of the Seafarers Union, Weingarten described him as a mentor and someone she counts on. She thanked the SIU for its longtime support of the New York-based United Federation of Teachers (UFT), where Weingarten was the president for 12 years. The UFT “will never, ever forget that we got our start and our help – every time there was a big issue – from the mighty Seafarers in New York,” she stated. Weingarten said that just as the SIU and other unions showed support for the Teachers in years past, the AFT, UFT and others now are carrying a pro-Jones Act message at every opportunity. When the Jones Act came under attack after Hurricane Maria, she learned about the law and equated it in part with prevailing-wage statutes, which help ensure fair compensation for workers. Weingarten has carried this message to elected officials and others during her many trips to Puerto Rico deliver aid and comfort to her union members on the island. Next, she spoke about Janus v. AFSCME, a case that figures to harm public sector union members as well America’s working families. In February, the Supreme Court heard arguments in the case. Pushed by anti-union forces, it aims to ban unions from collecting dues or agency fees from all state and local workers, ostensibly because it would violate the workers’ First Amendment rights. Anti-union groups recruited Mark Janus, a dissenter in an AFSCME-represented workplace, to say that by the very act of collecting the money, the union – through state action – forces him to support political stands he disagrees with. The court’s ruling is expected in June. Most pundits believe it will go against organized labor and workers’ rights. Nevertheless, the nine-day strike in West Virginia proved that solidarity, grassroots mobilization and sharing the union message all work. While much of the press coverage focused on wages, the teachers and their allies also defeated an expansion of charter schools, killed a proposal to eliminate seniority, and scuttled a so-called paycheck-protection bill (aimed at weakening unions by taking away their right to deduct dues through payroll collection). Turning to Puerto Rico, she commended maritime labor and Jones Act operators for all of their relief efforts, including the delivery of needed water filters through the AFT-led and union-supported Operation Agua..